The Reverend Dr. Perzavia Praylow, is pastor of Fifteenth Street Presbyterian Church located in Washington, D.C. Her roots stretch from the Sea Islands of South Carolina to the sky line of Jersey City, NJ where she was born and raised. Rev. Perzavia Praylow is an ordained minister of Word and Sacrament serving in the Presbyterian Church U.S.A.
Reverend Praylow previously relocated to Washington, D.C. from the Southern states of South Carolina and Georgia where she divided her time between her leadership/work as a pastor and a professor. 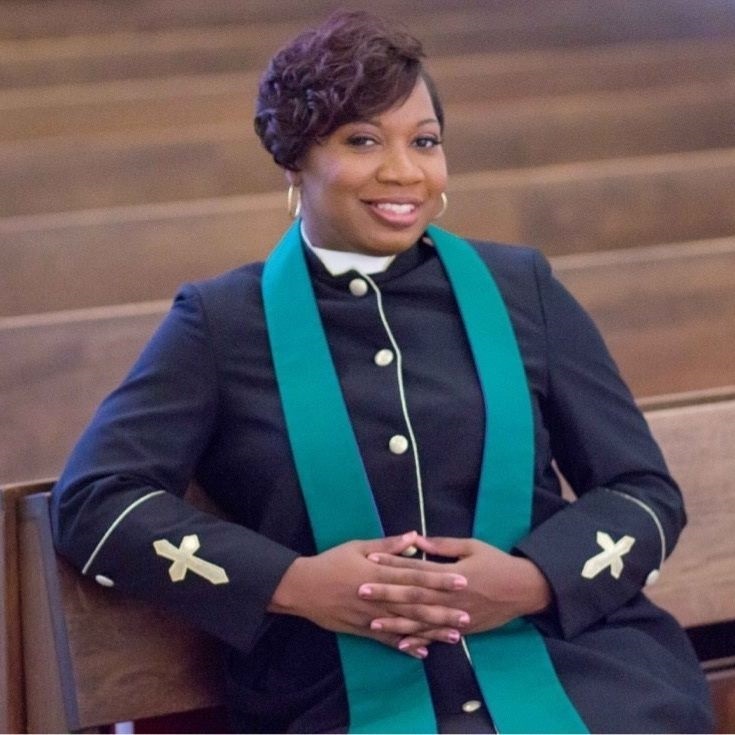 Between 2015 and 2018, she divided her time between pastoral leadership at Calvary Presbyterian Church (Winnsboro, SC) and collegiate adjunct teaching and research at Benedict College (Columbia, SC). She previously served as an assistant professor of American History at Augusta University (2012-2015), where she taught courses in African American and American history. She is also a recent graduate of the Master of Divinity degree from Columbia Theological Seminary (May 2016) – which is a seminary of The Presbyterian Church USA. At Columbia Seminary (Decatur, GA), her seminary studies also included a focus on practical theology, Christian leadership, congregational studies and the praxis of ministry in congregations. She recently completed a yearlong residency as a chaplain resident at Palmetto Health Hospital (8/2016-8/2017). She graduated from this chaplain residency program in August of 2017. Continuing in her ministry as pastor of Calvary Presbyterian Church until early 2018, she is most passionate about serving the church in the areas of youth and young adult ministry, pastoral care and congregational revitalization. Related to her educational endeavors, Rev. Praylow received a BA in history and Africana studies from Drew University in Madison, NJ (2002). She also received a Master of Arts degree in Education Policy (2005), a Master of Arts degree in History (2009) and a Ph.D. in African American History (2012) all from The University of Illinois located in Champaign, IL. Reverend Praylow has preached and taught in Christian ministry in the areas of Christian education, transformative pastoral care, youth and young adult ministry, congregational revitalization and spiritual formation for twelve years since 2005 when she was first licensed as a minister in Champaign, IL. Whether she is preaching or teaching the Gospel or serving God’s people, within, between and beyond the walls of the “Church” and the “Academy” her greatest desire is to humbly use Godly truths to empower God’s people to reach their greatest potential in Christ. In her pastoral ministry, she previously served as an associate minister/elder at The Church of The Living God in Champaign, IL. While living and studying in Champaign, she answered the call to preach. She was first licensed (2005) and ordained into the ministry (2007) by her spiritual parents --Bishop Lloyd and Evangelist Mary Gwin—who are the co-pastors of The Church of The Living God. Previously, Rev. Praylow served for one year as an associate minister at Tabernacle Baptist Church in Augusta, GA (2012-2013). Before her call into ordained ministry in The Presbyterian Church USA (6/2016) and during her candidacy for ministry in the PC(USA) (9/2013-6/2016), Dr. Praylow was a member of New Faith Presbyterian Church in Greenwood, S.C. During her time at New Faith Presbyterian Church, Dr. Praylow was a seminary student at Columbia Seminary and was also under care of Trinity Presbytery during her candidacy process for ordained ministry. She was also a supply preacher at Mattoon Presbyterian Church (1/2015-8/2015) located in Greenville, SC in addition to serving as a supervised ministry intern at Decatur Presbyterian Church (Decatur, GA) during her second year of seminary studies at Columbia Seminary 9/2014-5/2015. As a scholar, Dr. Praylow writes and researches from a broad historical and policy research agenda around the themes of race leadership, education, African American social and community development, Black church history and the role of nonprofit organizations in promoting social justice. Related to these broad interests, Dr. Praylow's first scholarly book in the field of southern history, Educating the Talented Tenth: Fisk University Students, the Politics of Race Leadership and the Struggle for African American Equality, 1866-2015 is being revised for publication. Dr. Praylow’s other scholarly writing projects include a history of the mission work of Black women ruling elders in African American Presbyterian churches in North and South Carolina and a history of black women’s schooling and higher education in the U.S. South between 1860 and 1930. Dr. Praylow also serves as a board member on the board and governing councils of local and national nonprofit organizations. Within the Presbyterian Church (U.S.A.), she is currently a member of the Coordinating Council of Trinity Presbytery and is completing her first term as a member of The Mission Development Resource Committee which is the grant making committee of the Presbyterian Mission Agency. Dr. Praylow has also served on the planning team of the National Black Presbyterian Caucus since 2015. She is also on the board of directors and strategy team of Next Church Conference --which is a national church growth/leadership development organization equipping and preparing ordained and lay leaders for ministry throughout The Presbyterian Church (U.S.A.). She previously served as chairwoman of the Brookland Foundation which is the community outreach foundation affiliated with Brookland Baptist Church in Columbia, SC. Lastly, Dr. Praylow completed a term as a member of the Board of Directors of The Lucy Craft Laney Museum of African American History located in Augusta, GA. In all her callings and within all her endeavors, Dr. Praylow’s greatest desire is to use all of her gifts from God in service to God’s people and God’s church. She is called to embrace a model of transformative leadership as she lives her life at the intersection of prophetic ministry, transformative pastoral care and collegiate teaching and research that promotes change.